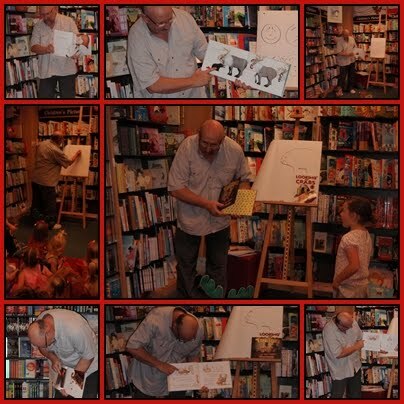 On Wednesday 30 November we had local author & illustrator Bruce Whately came and present a special Christmas Story time. Bruce works as Jackie French's illustrator and they have collaborated on many books since their first "Dairy of a wombat". His latest books (yes he has THREE new releases), is "Christmas Wombat" with Jackie, "Tin Toys" with his son Ben and he has illustrated Ahn Do's "The littlest refugee". He read several of his books including "Wombat's Christmas" and the one that started it all "The ugliest dog in the world" (1992). It was hard to find a complete list of Bruce's books as he is signed up to so many publishers. here is the most up to date list I could find. He then spent some time drawing for us, singed many many books and happily posed for many photos. 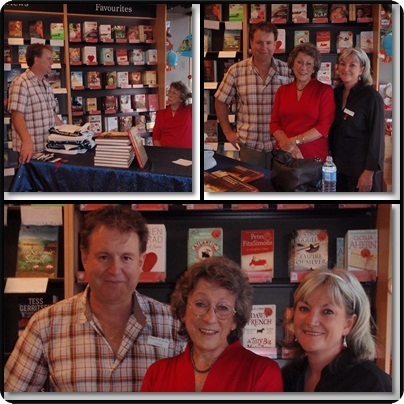 Just last Saturday we had Joy McKean, Slim Dusty's wife, join us for an informal book signing. "Iv'e been there, and back again" was a book many years in the making and is I guess the story behind the songs and the family tours. She was delightful and I was surprised at how spritely she was. we had over 30 people come to meet her. Again I took pics of anyone who wanted one and after Christmas I will email them out. So many interesting people to spend time with! Congratulations too on becoming a great aunty to little violet what a sweet name!